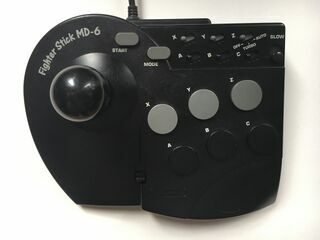 The Fighter Stick SG-6, known as the Fighter Stick MD-6 in Europe and Fighter Stick MD in Japan, is a six-button arcade stick for the Sega Mega Drive by ASCII, opting as an alternative to Capcom's CPS Fighter MD. The Fighter Stick SG-6 is smaller than Sega's official Arcade Power Stick, though was sold for a cheaper price and has a metal base for added weight. Unfortunately, this particular compound is prone to oxidation, so though not affecting the performance of the unit, those stored in wet environments have not aged well. Like the CPS Fighter, a version of this joystick was also released for the Super NES called the "Fighter Stick SN".